Shake off loose mud,dirt and stones before your vehicles hit the highway! 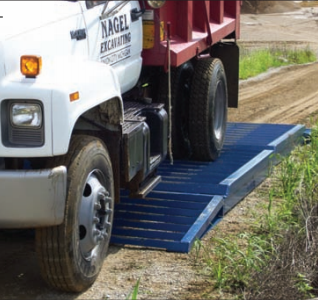 Simply place the Exit Grid on the haul road just before your vehicles enter the paved streets. When vehicles drive over the Exit Grid, the tires will be shaken and flexed, to dislodge rocks, dirt and other debris from the treads. This cleaning process helps remove the excess dirt and debris that may be distributed on paved streets and highways. It also removes stones and rocks that can result in broken windshields and insurance claims. It will reduce the time and money involved in street cleaning and water truck use, and help build goodwill with the neighboring public. 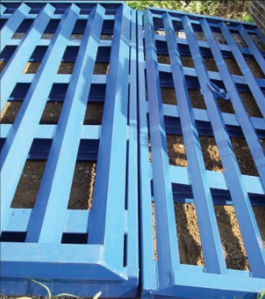 The GME Exit Grid System consists of two 4' x 12' ramps, and two 8' x 12' bed sections. It is constructed of angular structural steel, welded to I-beams and steel tubing for maximum rigidity and durability. The unit can be installed in minutes and left in place for prolonged periods.When necessary after periodic use, debris can be easily removed from under the GME Exit Grid. More and more states and municipalities will be requiring that preventive control measures like the GME Exit Grid be employed, to help maintain environmental standards for air quality and keep streets cleaner and safer for all vehicles. For complete specifications and purchase or rental information, contact your local GME distributor or call 800-248-2054.